Conservation and the Bottom Line – Dell Technologies, Inc.
On Ocotober 29, Michael K. Murphy, VP of Environmental Affairs at Dell Technologies, Inc. presented at Texan by Nature’s first annual Conservation Wrangler Summit & Celebration at the George W. Bush Presidential Center in Dallas, Texas. 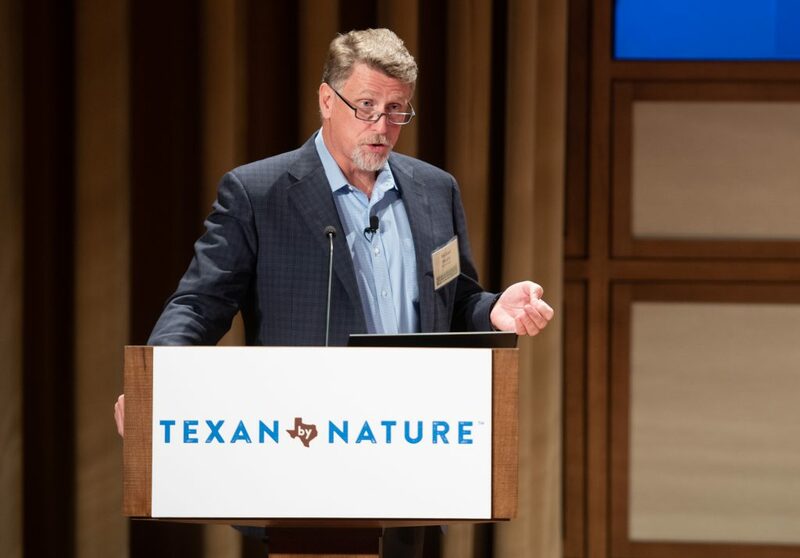 This important event brought together over 200 Texas leaders to engage in a thought-provoking summit exploring the beneficial connection between conservation and business. The event culminated in a gourmet meal and celebration of the 2018 Texan by Nature Conservation Wrangler projects. Conservation isn’t just good for natural resources, it’s good for the bottom line. At the Summit, attendees learned how Dell Technologies has used its culture of innovation, engineering, and supply chain expertise to become one of the biggest recyclers of plastic in the world. From recycled materials to internal practices, Dell has worked to measure the impact and benefit of its conservation practices to both bottom line and culture. To to kick of the session, Michael Murphy shared the story of Dell’s inception. Thirty-four years ago, Michael Dell started PC’s Limited which would eventually become Dell Technologies in his UT freshman dorm room. His business model was revolutionary at the time –manufacture PCs and sell directly to the consumer. Michael really took UT’s motto to heart – what starts here in Texas really does change the world. Today, Dell Technologies is a nearly $80B business with operations in 180 countries and 145,000 team members around the globe. Dell Technologies has had a huge contribution to the Texas economy, paying team members approximately $1.7 billion in salaries, spending over $3B with TX-based suppliers. In total contributing almost $10 billion in value to the Texas economy. Michael Murphy elaborated on what the world may look like in 2020, 2030, and what role we play.We’ll be at 8.5 billion by 2030 with 3 billion more people entering the middle class. If we consume at the same rate as the U.S. does today, it will take 5 Earths to meet demand. That’s simply not sustainable. He mentions that Dell’s customers are paying attention to this, in fact 75% of their request for proposals ask about our corporate responsibility efforts. 92% of their top 400 customers share their priorities around corporate social responsibility. Dell sees sustainability as good, smart business. It creates efficiencies for customers, reduces our costs and drives innovation. 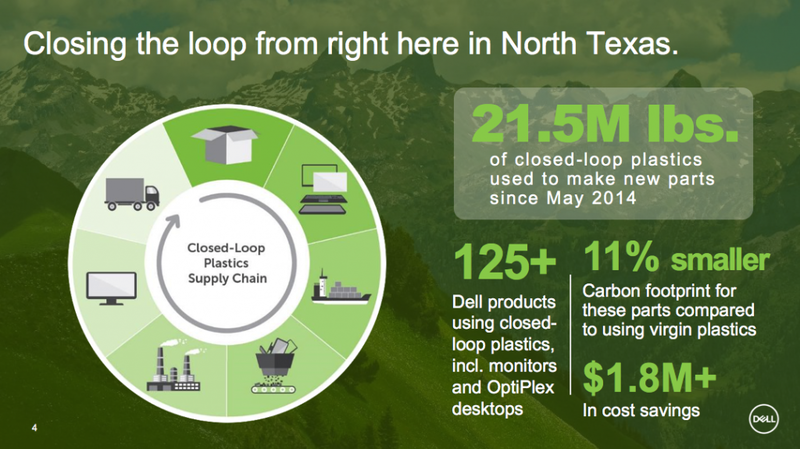 Since 2013, Dell has used 22 million pounds of e-waste plastics in 125 new products. Cutting carbon emissions and saving more than a million dollars. In 2015, Dell became the first company in the industry to use reclaimed carbon fiber from aerospace in its products. That’s material unusable for aerospace, but meets technology’s material requirements perfectly. To date, Dell has kept 1.3 million pounds of carbon fiber from being landfilled. In the spring of 2017, Dell put their materials innovation engine to work to help address the issue of ocean plastics. Dell was pretty concerned with the overall state of the oceans and felt they could play a role by intercepting plastic headed into the ocean and using it in their packaging. A year ago they formed a consortium called NextWave to encourage broad private sector collaboration that scales the use of ocean-bound plastic across industries. The group estimates they will divert more than 3 million pounds of plastics and nylon-based fishing gear from entering the ocean within five years, the equivalent to keeping 66 million water bottles from washing out to sea. Last spring, Dell introduced a new pilot program to put e-waste gold back to use in new technology. Did you know your technology contains gold? There is up to 800x more gold in a ton of computer motherboards than a ton of ore from the earth. The extraction process which is 99% more environmentally friendly than mining ore from the earth is right here in North Texas. Dell has also partnered with a designer to upcycle the gold into a jewelry line called Bayou with Love X Dell.